Cancers that occur in the kidney are primarily treated by surgical excision of the kidney and in some instances of the ureter (the tube that connects the kidney to the bladder). Cancers of the kidney often diagnosed incidentally when CT scans are performed of the abdomen and pelvis. Many of these cancers are quite small when initially diagnosed and sometimes just the tumour itself can be removed leaving the remainder of the normal kidney (partial nephrectomy). If the tumour is larger or in a position that makes removal of the tumour alone difficult or dangerous then the whole kidney must be removed. This can almost always be performed by keyhole surgery (laparoscopic nephrectomy). Three small incisions each measuring about 1cm are made in the abdomen through which a camera and instruments can be inserted. The kidney is freed up from all adjacent structures. The large artery and vein taking blood to and from the kidney can be clipped with stapling devices. A small incision is then made in the lower part of the abdomen and the kidney, having being placed in a bag, is removed through this incision. This incision usually heals quickly and without significant pain and patients can often be discharged from Hospital after 2 or 3 days. Even though larger tumours may be amenable to laparoscopic nephrectomy, some large tumours may still require an incision to be made. Laparoscopic nephrectomy is usually associated with minimal bleeding and patients often recover in much shorter periods compared to open operations. 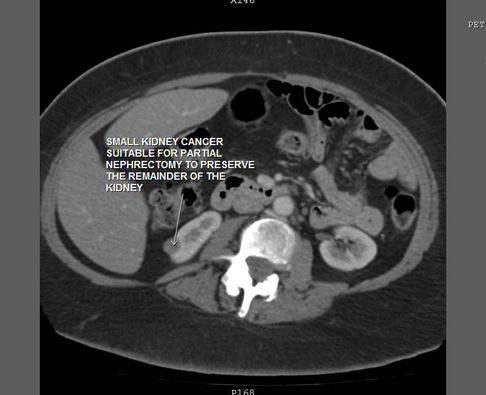 If the tumour identified in the kidney is small or in a favourable position it is often possible just to remove the mass itself. This can be performed by keyhole surgery, often using robotic surgical techniques. The artery supplying the blood flow to the kidney is identified and a temporary clamp is placed on this artery. The tumour can then be excised and the defect in the kidney is sutured before the arterial clamp is released. This procedure preserves a large portion of the kidney that is normal and often scans performed years later do not show any obvious defect associated with the previous surgery. 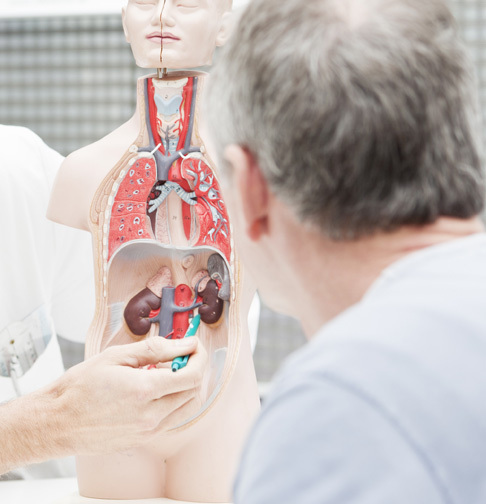 It is uncommon for kidney cancer treatment to involve either chemotherapy or radiotherapy. In some instances a type of chemotherapy can be used if the cancer has spread and this will usually be administered by an Oncologist. In situations such as this it is often thought to be beneficial if the kidney is removed to reduce the overall cancer burden but again this will need careful discussion with the urologist and your oncologist.